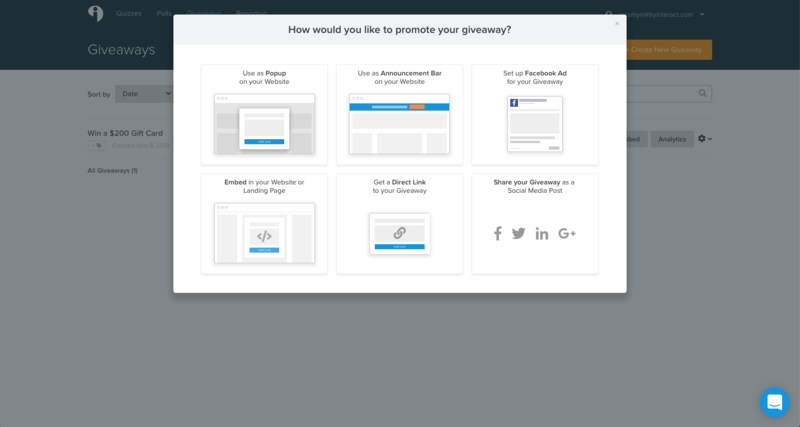 Giveaways are incredibly effective for driving new contacts into your email list. The appeal of getting something for free is often enough to get new contacts through social media or your website, and they come at little cost to you as a brand. Below we’ll go through the basics of getting a giveaway up and running your website or blog to build your email list and generate social buzz around your brand. To get started, click “Create New Giveaway” in the top right hand corner of the dashboard. It will take you to the following screen shown below. You can add content by clicking into each text box. 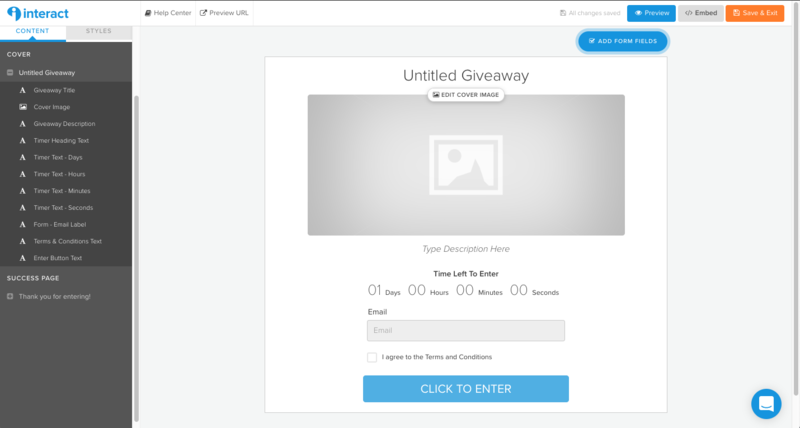 Using Interact, you can create a giveaway that matches your site’s branding. This is important because you want potential entrants to feel comfortable putting in their information in order to enter, so the giveaway should look and feel like part of your site, just like the example above. You can customize the font, colors, and cover photo of your giveaway, and even upload an image as the background of the giveaway. The 'behind the scenes' of a giveaway is where you’ll set up the timing for when it will run, how to enter, etc. Click the EDIT button on the left-hand sidebar for “Giveaway Settings"
1. When the giveaway will run. This is where you set the start and end dates of the giveaway. Interact will automatically set a timer that counts down to the end date to create a sense of urgency for potential entrants. 3. Additional ways to enter. The primary entry method for giveaways is through an email address, so you can build your email list. There are also additional social ways to enter, these include liking on Facebook, sharing on Facebook, Sharing on Twitter, Following on Twitter, Pinning on Pinterest, and Following on Pinterest. 4. Social Accounts. Connect your social media accounts to validate social entry methods. This is required for social entry methods (section 3). For example, we would write “TryInteract” because this is our handle for each Facebook, Twitter, and Pinterest (no need to include symbols). At Interact, we always focus on building your list. Email lists are extremely valuable, especially when you know something about the subscribers who are on your list. 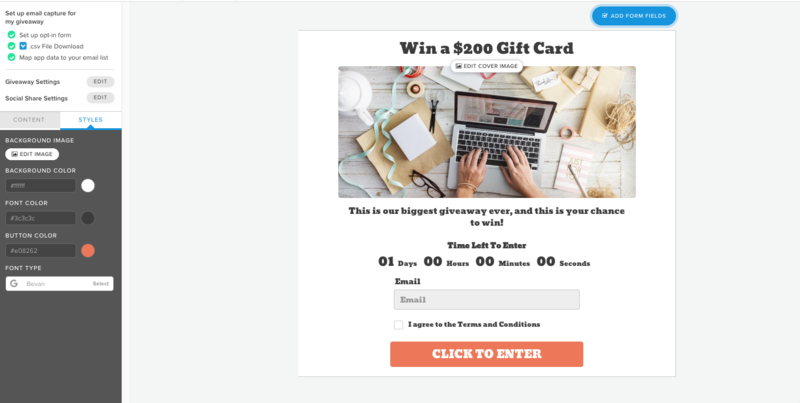 In the case of giveaways, you can connect Interact to your email marketing or marketing automation program and select a list that you want new contacts to be added to. These new contacts that come through the giveaway will be marked by the giveaway they came from, so you can follow up accordingly. 1. First, click on “Set up opt-in form” in the top left hand corner. 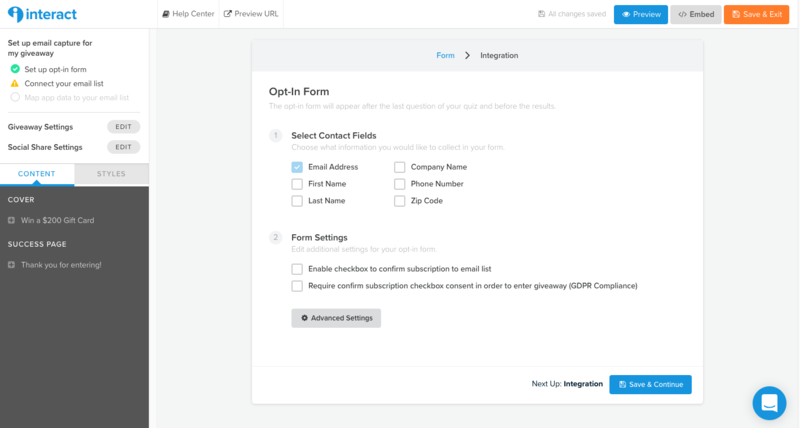 Select the contact fields you wish to collect from users and if you’d like to enable either of the form settings. Make sure to click Save and Continue once finished. 2. Next select your email marketing system. If not already connected, it will ask for user authentication/login information. Otherwise, it will automatically connect you. 3. Run through the mapping portion. This is how and where Interact will send your leads to. 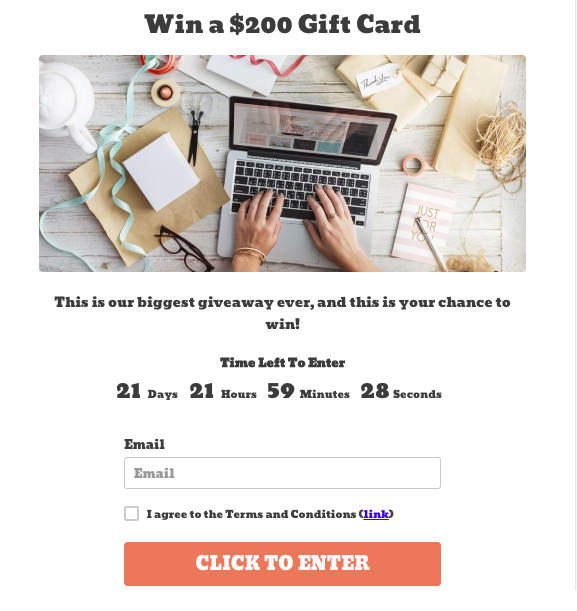 Make sure to set up your list inside your email marketing system prior to connecting to your giveaway. 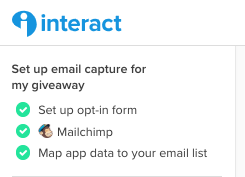 Interact pulls existing lists from your email marketing system. 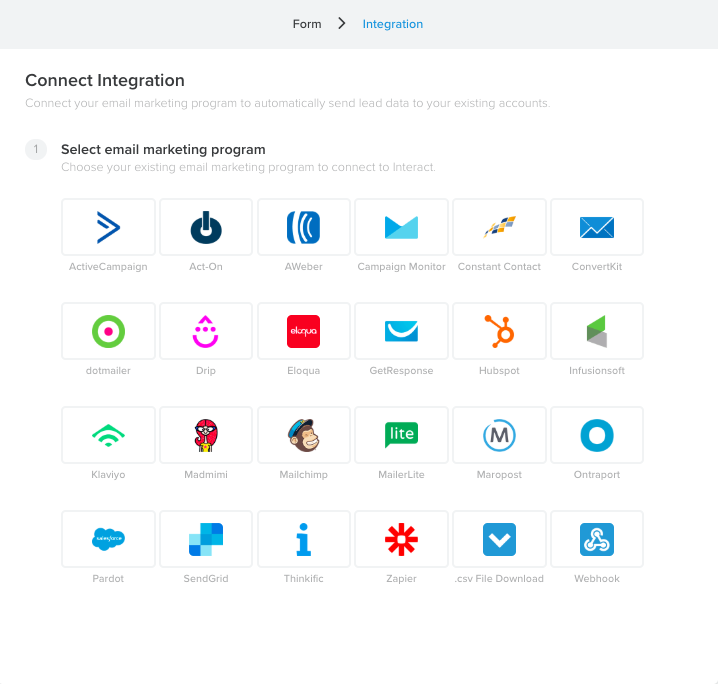 Make sure you see three, green checkmarks on the left-hand menu to confirm your integration was fully connected. Once your giveaway is all set up, click “Embed” in the top right-hand corner of the builder. You’ll be presented with a variety of options for sharing it and embedding it in order to get it in front of your target customers. Promotion options are similar to promotions for quizzes. 1. Popup/Announcement Bar: In order to use the popup and/or announcement bar on your website, you will need to install a code snippet on your website. 2. Facebook Ad: Click here for instructions on setting up a Facebook Ad. 4. Direct social share options: You can click the social share buttons to share your giveaway directly to social networks or copy the Direct Link to your social media. Once your giveaway is embedded on your site, it will look like part of the page and people will be able to enter by putting in their contact information. Once someone enters, they’ll be presented with additional entry options that involve sharing and following on social media. 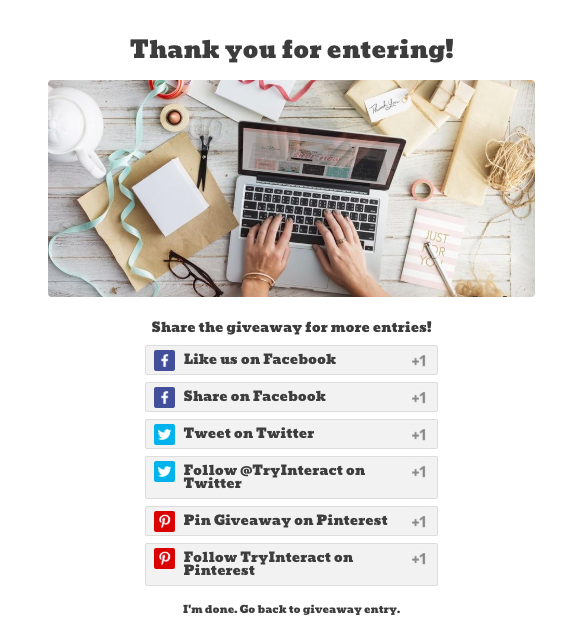 People entering the giveaway will stay on the same page on your website and be presented with additional ways to get more entries by taking social media actions. How do I choose a winner? Interact cannot choose winners for Giveaways. To choose a winner we recommend using Google or uploading your list to Random. Why can’t I start my Giveaway without a terms and conditions? 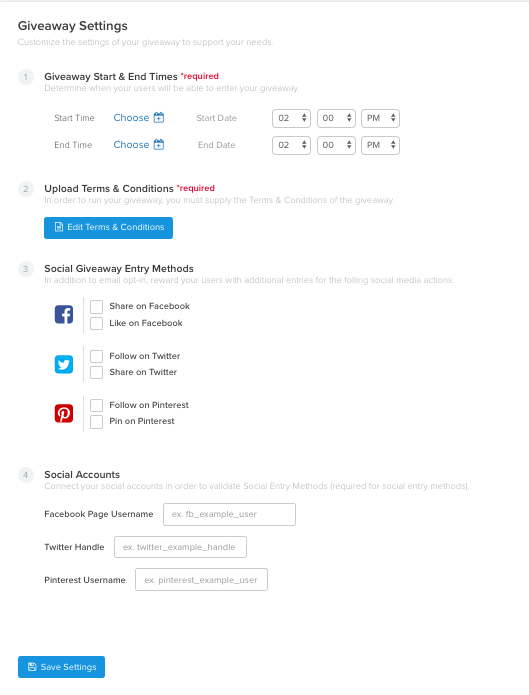 You are legally required to have a terms and conditions for a giveaway. Therefore, we require you to upload or link your terms and conditions for the Giveaway. We cannot legally advise on what to write in your terms and conditions. Can I connect my Giveaway to my email marketing system? Yes, however it automatically connects to .CSV. To connect to your email marketing system you will need to manually disconnect .CSV and connect your email marketing system. Time Zones: Time and date will automatically be set to the time zone you are in. In case you are targeting customers in other time zones, you will have to manually calculate the correct time.